Two new studies in humans published in Science in November 2017 support previous findings in mice: that response to cancer therapy is dependent on the gut microbiome1,2. This opens the possibility for researchers to explore deliberate exploitation of the microbiome in improving the efficacy of cancer therapy. While checkpoint inhibitors have been a great leap forward in the treatment of certain cancer types, only a limited portion of patients respond satisfactory to the therapy. Many researchers have come to suspect the gut microbiome plays an important role in modulating this response. Both studies tracked the responses of cancer patients to immune checkpoint inhibitors, a type of immunotherapy that prevent cancer cells from switching off T cells' anti-cancer activity, and looked for possible involvement of the microbiome in patient responses. In the Science papers, it was shown that responders and non-responders have different compositional and functional features of their gut microbiomes. It appears beneficial for the efficacy of checkpoint inhibitor therapy to harbor high levels of Akkermansia munciniphila, Faecalibacterium and other specific commensals in the gut. The authors used germ-free mice in both studies to demonstrate a potential causal role of the microbiome by transplanting feces from the human patients into the mice. The results were unequivocal: in both cases, mice receiving gut microbiota from non-responders did poorer on immune checkpoint inhibitor therapy than mice colonized with feces from responders. Immunological profiling of the patients and the mice suggested that the favorable microbiome of responders enhanced systemic and anti-tumor immune response, whereas the microbiota of non-responders was causing the host to have impaired anti-tumor immune responses. If possible, avoiding antibiotics prior to and while taking checkpoint inhibitors may improve the response to the therapy. The microbiome may be a predictor of response to therapy, enabling targeted modulation of the microbiome from an early time point. Clinical trials testing the benefit of modulating the microbiome of cancer patients receiving checkpoint inhibitors are already underway. Seres Therapeutics recently announced the plans for testing their preclinical live bacteria candidate SER-401 in combination with anti-PD-1 therapy. 1. Routy et al. 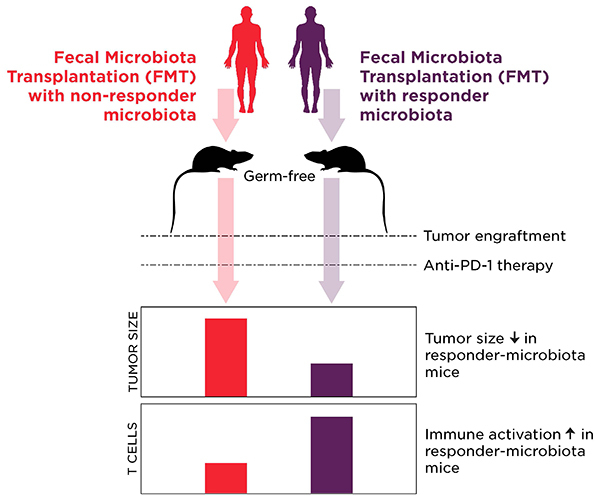 Gut microbiome influences efficacy of PD-1-based immunotherapy against epithelial tumors. Science, 2 Nov 2017. 2. Gopalakrishnan et al. Gut microbiome modulates response to anti-PD-1 immunotherapy in melanoma patients. Science, 2 Nov 2017.